Heat oven to 400°F. Spray 13x9-inch (3-quart) glass baking dish with cooking spray. Cut onion and bell pepper into even slices; place in baking dish. Cut chicken breasts into thin strips; add to vegetables in dish. Sprinkle with seasoning mix; drizzle with oil. Stir until combined and pieces are coated. Bake 35 to 40 minutes, stirring once halfway through baking, until chicken is no longer pink in center. Spoon small amount of chicken and veggies onto each tortilla. Top each with sour cream, salsa and cilantro, or your favorite fajita toppings. You can use any color of bell pepper you want in this dish…or even add more than one kind. This also tastes great with a squeeze of lime juice over the baked chicken and veggies! Not every fajita recipes comes in a sizzling skillet that smokes up your kitchen. 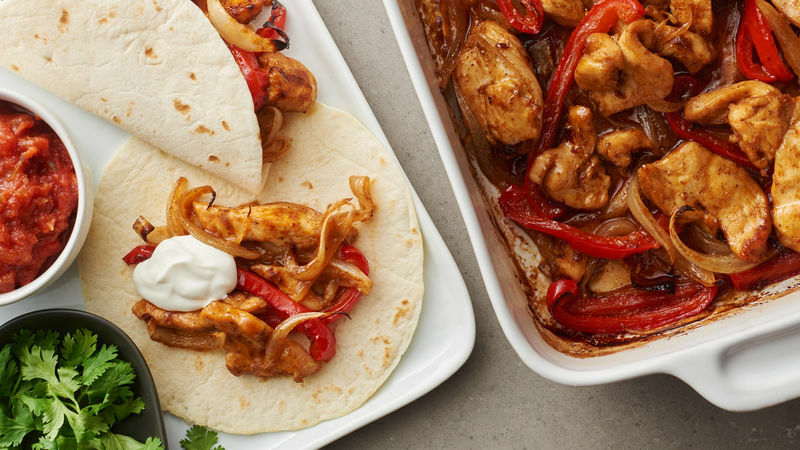 This fajitas recipe is crazy-easy — red bell pepper and onion slices are piled into a greased casserole dish and topped with chicken breast strips. Next, you drizzle with oil, sprinkle with seasoning mix, toss to coat and 35 to 40 minutes later dinner is served! We love the idea of assembling these fajitas at the table. Simply serve alongside tortillas, sour cream, salsa and cilantro to complete the meal! Lime juice is a common condiment in Mexican cuisine. Just squeeze a little on the chicken and veggies for a bright, tangy flavor boost.